Casa Piedra is a homely country casa with a modern interior and cosy atmosphere, and surrounded by the native pines of Formentera, it affords a good level of privacy and tranquility. This lovely casa will appeal to families and couples looking to relax in the peace & quiet of the Formentera countryside, yet not be too far from the restaurants, shops and bars of Sant Francesc or the beach at Cala Saona. Casa Piedra has 3 large bedrooms; one with a double bed, one with 2 single beds and one with 3 single beds. The lounge/dining area is a large light space to enjoy evenings, and has a TV and stereo. The fully equipped kitchen is accessed off the lounge and includes coffee maker, microwave and dishwasher. This homely casa has 2 bathrooms, one bathroom inside the house, plus a further outdoor bathroom. The house also benefits from wifi internet, burglar alarm, and washing machine. Casa Piedra has a grand covered terrace with a large dining table seating 6, making it perfect for al fresco dining and lazy morning breakfasts. Various sun loungers and umbrellas are arranged around the completely private back garden and a bbq is also provided. The sea is a 5 minute cycle ride away for lovely cliff top walks and Cala Saona beach is a 10 minute drive away. The closest supermarket is next to bar Es Cap, a 10 minute drive away. 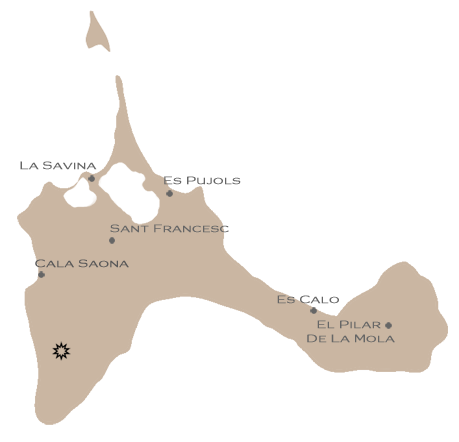 The nearest town is San Francesc, about 10 minutes up the road for all amenities including bakeries, bars and shops. The lighthouse of Cap Barbaria is 3 km away.